Congratulations, your art is better than the actual game. 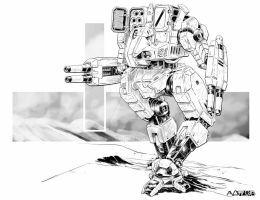 Most of MWO's abundant failings would be fixed if we could have Melee. Like a hunchback grabbing another mech and then firing it's AC20 at point blank. But that ^^ is just epic. Wow, that is so fantastic! Now one of my favorite pieces! i know the game, but still. Oh man that drac Mauler is fucked. "I thought those claws were merely decorative." "They are, AND THEY LOOK BETTER IN RED... STRAVAG I MISSED THE COCKPIT!!" It´s unrealistic, as Clanners view hand-to-hand combat in mechs as dishonorable. The claws on the Kodiak are merely decoration. Depends on which clans you mean. 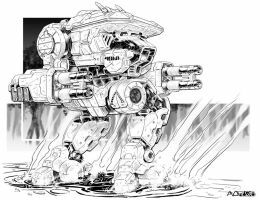 Because by the 3100s melee is accepted as a possible inevitably in close quarters mech warfare by the Clans. Sometimes a punch to the face does more then 8 Clan ER Medium lasers. In fact by the 3100s it was custom to give some in Solhama units unarmed Agromechs in order for them to win back their honor through melee combat, which is almost a death sentence in most situations. 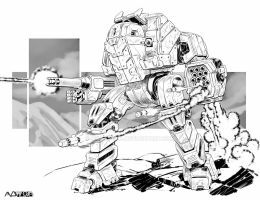 One of Tassa Kay's best Mechwarriors when she formed the Wolf Hunters in 3135 used one, and he tore the arms off enemy mechs left and right, earning himself a proper battlemech under her command. I meant that specifically for Clan Ghost Bear, since this pic most likely represents the Combine/Ghost Bear war. And the claws of the Kodiak ARE just decoration. Because honor is their prime concern, everything they do is to earn it. This became lore because Clan mechs and weapons are so powerful already, allowing them to do brawling would have made them completely OP. Thus, the "social consideration of hand-to-hand combat in mechs as disgraceful and without honor" thingy. Same with the "focused fire"
I know all of this. Ive been a B-Tech fan for years and a Clan fan for that long too. And often, personal ambition takes the place of honor behind the scenes. As one of B-tech book cover says, Honor above all else....except vengeance. Sounds plausible, a personal grudge settled in the midst of battle. I totally understand your thinking, but Clanners risk becoming Dezgra and losing everything they gained by such an action. Thus, clanners do not even get that close to an opponent that hand-to-hand combat is viable. Why should they? Their weapons have superior range to pretty much all of the IS counterparts (except the LRMs). Tell that to Joanna after she fried Natasha Kerensky. Tell that to the Falcon pilot in one TRO who displayed their skill at the stick by getting close enough to an opponent to tap them. Remember that all of the Clans that were involved with Operation Revival were ex-communicated by the Homeworld Clans for being tainted by their contact with the Inner Sphere. Joanna had all her weapons destroyed by Natacha, she had nothing left but her JJs. And you seem to forget that this mech is Clan Ghost Bear. The entire Clan moved to the Inner Shpere. Who says that I forgot? You blanketed the Clans by stating "but Clanners risk becoming Dezgra and losing everything they gained by such an action. Thus, clanners do not even get that close to an opponent that hand-to-hand combat is viable.". Every single novel containing Clanners points that out. The Rule Books for the Table Top game point it out. Even in MechWarrior 4 it´s mentioned. As far as i got it, that was created as background lore for them together with the "not focusing fire" because their mechs and weapons were too OP at the TT otherwise. And yet here we are. A Kodiak smashing the ever-loving snot out of a Mauler. It´s the Clan way of thinking, Inner Sphere is much more pragmatic about that. 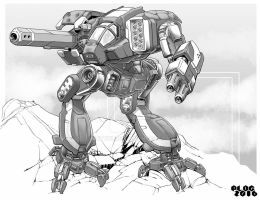 They not just introduced h-t-h weapons for mechs, they even designed entire mechs around them. People draw drawings that look like CGI footage, and I can't even draw a straight line. 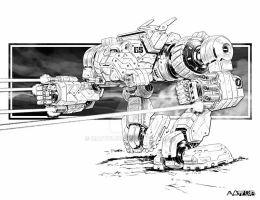 This my friend is called Mechwarrior. And that InnerShere freeborn is feeling the true power of the Clans. Guns? We don't need no stinking guns! Gun's are for wussy's, all i need is a sword.